Again, image taken from the audiobook to save your eyes from obliteration. Really. At any rate! 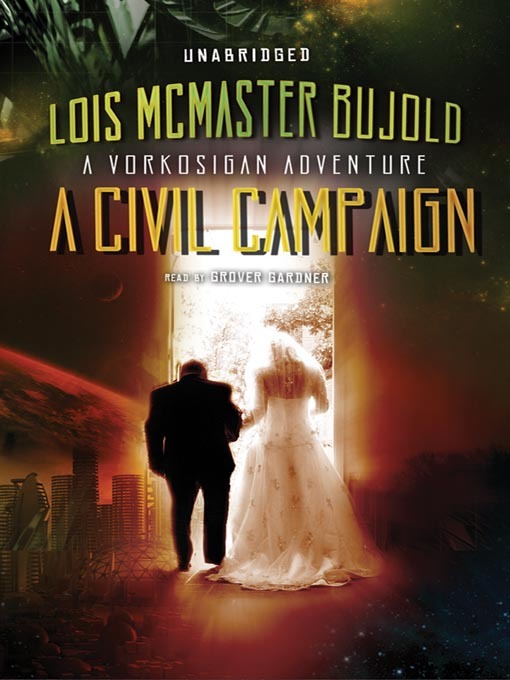 Skipping ahead slightly on my Vorkosigan readthrough - I've already reviewed a few of the intervening novels (which you can view by clicking the 'Lois McMaster Bujold' tag on the bottom of the post) - A Civil Campaign became my next target. One of the lightest reads of the series, A Civil Campaign is exactly what it describes: Miles applies his military tactics to a social engagement... With limited success, as you might imagine. And naturally, and in true Bujold fashion, all of these schemes collide. Dramatically. A Civil Campaign features most of the Vorkosigan series' most memorable characters, and as such it's also one of the most amusing novels in the series - especially with the political intrigue, which is resolved... Interestingly. My brief summary may give you the impression of a hefty dose of vaguely romantic cliche: not a bit of it. While the initial setup seems like it could lead in that direction, Bujold readers will know that stereotypes are rarely left unturned; cliches seldom played straight - and this is no exception. Miles' attempts at romance are structured as a military campaign - which as you can imagine has some rather gaping problems. Though these were amusing (though embarassing - if you don't have a high threshold for that, you may have to skip a scene or two), I preferred the intrigue occurring between the Counts. The series has alluded to interesting moments in Barrayaran politics since it began, and to finally see more of them that just a single scene is one of the most satisfying aspects of the book. A Civil Campaign, like Komarr and unlike every other Miles novel, switches viewpoints between Miles and Ekaterin - but this time, adds Ivan as well. Ivan is lazy as ever and hilarious despite (and perhaps because of) it, but Ekaterin, though a strong female figure, simply can't match up to Miles and Ivan for sheer character. It doesn't help that her side of the plotline is by far the least interesting: for the most part the unwitting object of Miles' affections, though engaging in some tactical manoevre of her own to keep custody of her son. I think part of it is she's simply far less proactive than Miles, and unlike Ivan, nobody is around to drag her deeper into a more interesting set of circumstances. Despite this minor weakness, A Civil Campaign shows us long awaited sequences in the series, and offers a great deal of entertainment on its own merit. It has more than a few references, so long-term readers will get far more out of it than those new to the series, but this is definitely a recommended read: an example of how even well-done circumstances can be twisted around to become one of the weirdest dramas of the series.